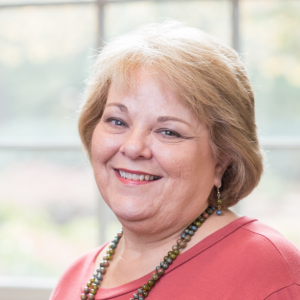 Deborah (Debbie) Woodrick Hall earned an MBA from the University of Mississippi in 1980 while she was working in the Vice Chancellor’s Office as academic program coordinator. She earned a Bachelor of Business Administration degree in 1977. Hall helped coordinate the first online registration at Ole Miss. When she left UM in 1983, she started a public relations career that led her to work with the Girl Scouts, United Methodist Senior Services of Mississippi, the United Methodist Children’s Home of Alabama and West Florida, United Way of Northeast Mississippi, and Boys and Girls Clubs of Northeast Mississippi. Hall also served as fundraiser at each place. Hall is the community relations director at North Mississippi State Hospital. During her tenure, she has been recognized as the Junior Professional of the Year by the Mississippi Hospital Association and was a graduate of the first Focus Program, a leadership development program of the Mississippi Department of Mental Health. Her job includes community education, and media and governmental relations. Hall and her husband David live in Verona, Mississippi.